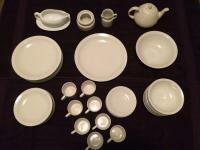 Available - white dishes, service for 8 (cups, saucers, soup bowls, salad plates, dinner plates, plus serving bowl, serving plate, tea set, sugar bowl without top, and creamer. Excellent condition. One dinner plate was broken but replaced with another plate. Cash and carry.